Does Pure Aluminum Exist In Nature? Aluminum is frequently found in nature as part of a compound, but does it ever occur naturally on its own? After seeing which of an assortment of canned goods, ranging from soda to tinned ravioli, can stand up to the heat of flowing lava (spoiler: none of them) and watching the cans melt into the lava, a question arose: Was aluminum a naturally occurring element or not? It turns out, that it can be, in very rare circumstances. Just in case it comes up on Jeopardy at some point: it's rare, but ~90% pure aluminum does show up occasionally as the result of extremely reducing conditions, as in Native Aluminum: Does It Exist? (PDF). But as you note, inside an extrusive igneous rock is not that kind of environment. The naturally-occurring aluminum flakes in question were found in Bulgaria, and you can read more about their discovery — and the process by which geologists speculate created them — in American Mineralogist. 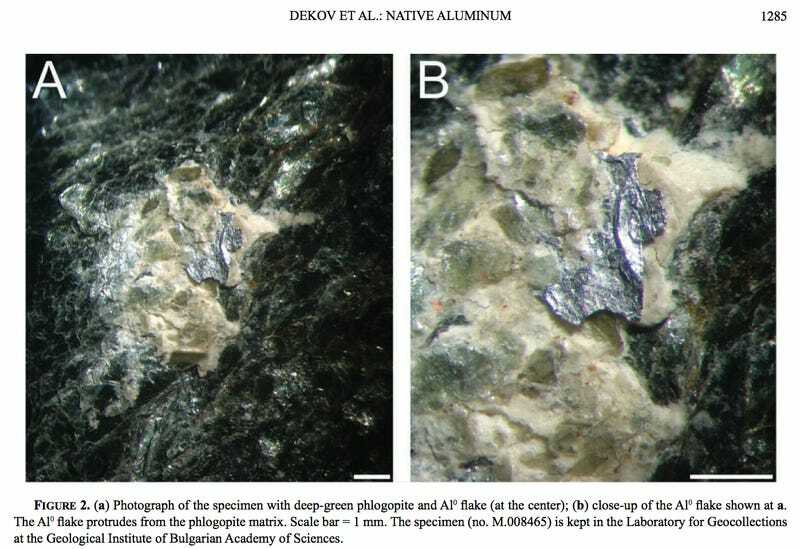 Image: The aluminum flakes / VesseLin M. DekoV in American Mineralogist.